I have just finished this epic piece of Historical Fiction which I LOVED LOVED LOVED and I do confess to chewing off as many ears as will listen regarding this wonderful novel. Set in Victorian England, 1893, this is an outstanding piece of historical fiction which explores superstition and the depths that our imagination can reach, especially when fear turns into hysteria. The local townsfolk are a superstitious bunch. The Essex Serpent is a mythical creature which lurks in the depth of the Estuary in Colchester, coming and going with the tide and carrying the weight of all unexplained mysteries and unusual occurrences which occur in the town. Mostly, the novel explores the meeting place of science and religion with two of the main characters being a Pastor and a budding Naturalist. William Ransome is a man of the cloth, loyal to his God, his family and his community but with a keen sense of wonder and delight of the natural world which causes him a great deal of internal conflict. Cora Seaborne does not suffer fools gladly. Following the death of her husband, she is finally unburdened of an oppressive and violent marriage and is now free to explore and observe the natural world, striding out on long walks clad in men’s clothing, searching for unusual fossils and reeling in childlike delight at her observations of the natural world around her. 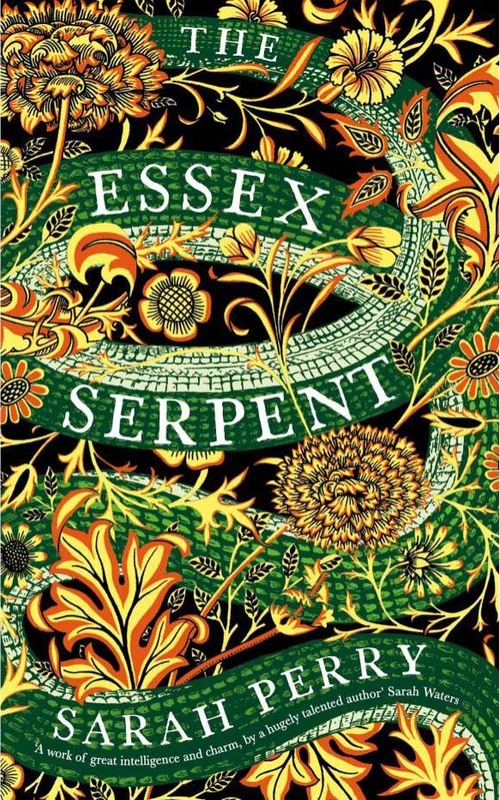 Cora is enthralled with the idea of The Essex Serpent, believing it may be an undiscovered species. Setting out on its trail, she collides with William Ransome who thinks the cure for this hysteria surrounding the serpent lies in faith, while Cora is convinced that science offers the answers. Sarah Perry’s characterisation is what sets this novel apart. The characters are so well formed and so real that while reading this novel they completely become immersed in your world and you in theirs. Cora and William are particularly memorable but I also had a real soft spot for Francis (Frankie), Cora’s son – a very peculiar introvert, painfully sensitive to the emotions of others with a penchant for collecting odd treasures like rocks, feathers and shells which he stores in his pockets, patting and counting with affection during moments of uncertainty. This novel has something in it for everyone; a murder, a monster, a love story and a heroine to rival the greats of 19th Century literature. Reading Sarah Perry’s writing and her fabulous command of language is such a gift which I couldn’t recommend highly enough.